An interesting group has assembled for Saturday's Sam F. Davis Stakes (G3), already with one Grade 1 winner among the 10 entrants for the Kentucky Derby prep at Tampa Bay Downs. A fast track is expected Saturday, and four of the last five Sam F. Davis heroes sat two or more lengths off the lead. Pacesetters usually place second through fourth, except last year, when Flameaway stole the race. In the last decade, every winner of this race finished first or second in their previous start. Read on to see handicapping by Laurie Ross of Pedigree Power and Ashley Tamulonis of From Coast to Coast. Counter Offer — He was turned back in the stretch by by So Alive in their last meeting. The pretty gray colt looked a little tired. Last year’s leading jock, Antonio Gallardo, has won or placed with every mount in route races over the last month. Ian Wilkes sent McCraken out for the win in the 2017 edition of The Sam Davis. Contender. Counter Offer — His only win was on the turf at Churchill Downs, and his two dirt starts have left a bit to be desired. He did run second in an optional claimer over this track, but I think I’ll pass. Going for Gold — He led through legitimate fractions in both starts and looked like a sure winner in the stretch, only to be nailed on the wire. The son of Atreides switched to Bob Hess Jr.’s barn last month and was fitted for blinkers. Going For Gold should handle two turns, as he’s bred to go long. The question is, will the blinkers help harness his speed around other pace-setting types? Could be a live longshot. Going for Gold — Scratched out of the Holy Bull in favor of this spot. He will race with first time blinkers, something that should help keep him focused, considering he has been getting nabbed late after doing all the dirty work on the lead. This would be a great spot to get his picture taken for the first time. Knicks Go – He has matched strides with the best. But notice something about his past performances? The only times this son of Paynter has won, he ran on a clear, un-pressured lead. I don’t see him winning here unless they let him gallop along a length in front, but he has a sharp work pattern and the class to hit the board. Exotics. Knicks Go — Has not raced since finishing a disappointing 11th in the slop in the Kentucky Jockey Club. He’s a Grade 1 winner and the Breeders’ Cup Juvenile runner-up, so the class is obviously there. A fast track will put him squarely in the mix, and he’s been training well for Ben Colebrook. Must use. Cave Run – After beating up on maidens, Cave Run didn’t have much to offer in the Pasco Stakes and was bested 10 lengths as the favorite. Works are uninspiring. Pass. Cave Run—It seems as though this son of Street Sense prefers an off track to a fast one. The local runner won on debut convincingly in the slop but could only manage a mild rally in the Pasco Stakes over a dry surface. If it rains, consider including on your tickets. Otherwise, probably not. Moonster – Here’s the Sam Davis “why?” horse. Beaten a combined 53 lengths in his last four starts, and had a good view of the backsides of Kicks Go, Improbable, Hog Creek Hustle and Federal Case. Having leading rider Samy Camacho aboard probably won’t help much. Pass. Moonster — I honestly don’t see anything I like here. The speed figures are below average. He did beat Kentucky Jockey Club runner-up Plus Que Parfait earlier in their careers but has not progressed since then. Pass. Kentucky Wildcat — This Chestnut son of Tapit is the first foal out of a multiple Grade 1-winning turf miler, who was equally adept on dirt, as she placed in the Breeders' Cup Filly & Mare Sprint. 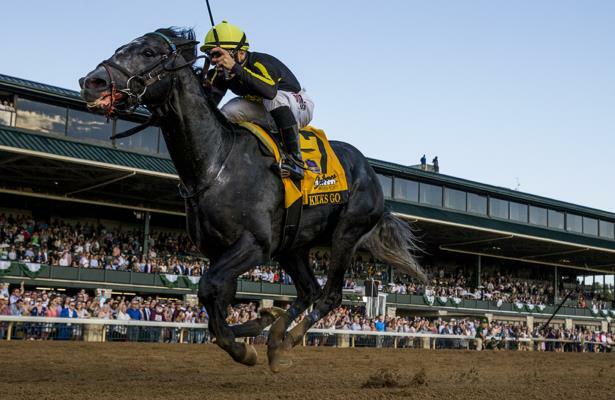 Kentucky Wildcat’s pedigree and performance show that he’ll improve with racing. Tom Albertrani gave his charge a second-to-last bullet five furlong breeze, and the colt should be ready to roll. Contender. Kentucky Wildcat — Out of Grade 1 winner Better Lucky and by Tapit, this colt has the breeding to be quite good. It took him three tries to break his maiden, but Tapit babies tend to mature a bit later than most. Regular rider Joe Bravo stays aboard and would do well to keep him involved early. Five Star General — He is one of five contenders who prefer setting the pace. With wins in two of three starts, this is a class test. Arnaud Delacour gave the colt a a trio of stamina-building bullet breezes in preparation for the Sam Davis. Jose Ortiz thinks enough of the colt to make the trip to Tampa. Five Star General’s late pace speed figures are in the bottom third of the field, and he’ll have to show improvement to make an impact. If he gets a good trip, maybe he’ll hang around for exotics. Five Star General — Rides a two-race win streak, including a stakes race in his last outing. It looks as though Delacour intended this one for the lawn, but his last two came off the turf, resulting in wins over a sloppy and a fast track. Ortiz had the mount in the Central Park Stakes and stays aboard for the Sam F. Davis. So Alive — He overcame a contentious start and looked like he was enjoying himself in his prep for the Sam Davis. The son of Super Saver turned back a mild bid by Counter Offer and looked like he could go around again. Todd Pletcher’s winning pattern in the Sam Davis is to give his charges a prep race at Gulfstream in January before shipping to Tampa. Last year Pletcher switched it up, giving So Alive’s half-brother, Vino Rosso, a start over the Tampa dirt. The colt returned to place third in the Sam Davis. Contender. So Alive — Never count out a Pletcher horse this early in the year. So Alive is 3: 2-0-0 with wins in the mud and on a fast surface. He also owns a win over this track with a decent speed figure. He will likely be part of the early pace, which could get hot. Half-brother Vino Rosso was third in last year’s Sam F. Davis, so perhaps So Alive can do as well, if not better. Worth a play. Well Defined — He traded places with Garter and Tie in the winner’s circle for two of last year’s Florida Sire Stakes. In his first prep this year, Well Defined tired to fifth behind Mihos in the Mucho Macho Man Stakes after chasing a lively pace. The son of With Distinction is competitive with state-breds and has thrown some fast speed figures while making the pace over a speed favoring track. Speed horses from outside posts have a tough task. Pass. Well Defined — He owns the fastest dirt speed in the field, but that figure came in restricted company over at Gulfstream. Since posting that figure, he’s run 12th in the Breeders’ Cup Juvenile and fifth in the Mucho Macho Man. This will be his second start off the layoff, and Kathleen O’Connell will send him out in blinkers for the first time. Could be a contender. Still Dreaming — He's carrying the burden of living up to his big brother Nyquist’s reputation. In his last race, the Graham Motion trainee was restrained in second place between horses before opening up under a hand ride to win by three lengths over a field of maidens at Laurel. The runner-up came back to win by three lengths. The only thing that concerns me is how intense this horse is when he runs. Ears pinned flat back the entire way, even when he was under a hand ride to the wire. He’ll need to use energy early to get a good spot from the far outside. Is he worth the hefty auction price tag of $460,000? Guess we’ll find out. Exotics. Still Dreaming — A half-brother to Kentucky Derby hero Nyquist, Still Dreaming broke his maiden at second asking when routing for the first time. Like Nyquist, he has an early running style. He jumps up in class here but stands a good chance against this group. Laurie: Half the field likes to run on the lead. The $250,000 question is, who will go and who will take back? Obviously, we won’t know until they spring the gates and see who has the best break. Previous Sam Davis winners have placed first or second in their last start, from a track that is not Tampa, and are pace pressers. Yes, a pace setter could win, but with all the speed in here, it’s unlikely. So, I hunted for a horse proven to win from just off the pace and is shipping in from another track. That led me to Kentucky Wildcat. Can sit off the pace? Check. Last race? Aqueduct. Plus, his late pace speed figures have improved in each start. Ashley: This is a pretty tough group. As Laurie pointed out, half the field likes to run on the lead, which seems to be a good thing at Tampa Bay Downs, though not necessarily for this particular race. While I do like Kentucky Wildcat, I had to go with a live longshot. Despite growing up in a non-horse racing state, Ashley has been a fan of the sport since a young age. Her love for horse racing was fostered through the kids’ book series Thoroughbred by Joanna Campbell, which led her to educate herself on the ins and outs of the sport. Since becoming actively involved in the industry just a few years ago, Ashley has had the opportunity to meet many important players in the industry, attend the Eclipse Awards, see personal favorite Mucho Macho Man race twice in person, and befriend many of the fantastic fans and horsemen involved in the sport. 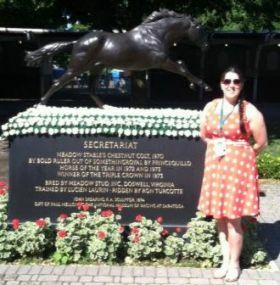 Ashley began her time with Horse Racing Nation covering racing in South Florida but also blogged about nationwide racing, industry issues and, from time to time, offered her opinion on how various changes could be beneficial to the industry. A move North to New Hampshire began both a new chapter in both Ashley's personal life and professional life. She currently pens the From Coast to Coast blog for HRN. Ashley also participates as a voter in the NTRA Top Thoroughbred Polls. An alumni of Macon State College, Ashley is from Central Georgia but is currently living in New Hampshire with her husband, Chris, and their two sons Charlie and Michael. A stay-at-home mom, Ashley juggles parenting with blogging and her other passions. Aside from horse racing, Ashley is a fervent football fan, enjoys reading and studying history, and hopes to someday author a historical work covering the Tudor period as well as biographies of horse racing’s stars, equine and human alike.